This is my 5th trip to Adelaide, Australia, a place I have fallen in love with and can’t get enough of. On previous trips I have flown with Emirates, Malaysia Airlines and, of course, British Airways. This time I booked flights through British Airways, however the first leg from Heathrow to Hong Kong was with British Airways, and the second part was with their Oneworld partner Cathay Pacific. As I would be flying back-to-back flights with British Airways, and then Cathay Pacific, I thought this would be an ideal opportunity to see how British Airways Club World compares with the ever more impressive business class products emerging from Asia and the Middle East. British Airways – I arrived in terminal 5 and there were only three people in front of me, with at least 15 check in desks open. Check in took a matter of minutes, helped along with a very polite, efficient and friendly member of check in staff. Cathay Pacific – As it was a connecting flight all I needed to do was stop at the transfer desk to pick up my boarding pass (I had already chosen my seat). They also needed to scan my luggage receipts to ensure my luggage would be transferred through Hong Kong to my next flight. British Airways – We used the Galleries North lounge in terminal 5. I have used this lounge, as well as the Galleries South, many times before and both always give a consistent lounge experience. They are spacious, clean and very modern although sometimes a little crowded as was the case on this occasion. The food and drink offerings were good. A selection of hot and cold food choices, as well as tea, coffee, soft drinks and various wines and spirits. They have all the well-known brands of spirits. They were, however, missing my favourite, Tanqueray. Nevertheless, an above average lounge experience. The stunning modern architectural feel to Terminal 5 never ceases to impress me. As our flight was departing from the C Satellite, we decided to visit to the lounge in the B Satellite prior to boarding. The lounge was similar in all respects, although it was a lot quieter. Cathay Pacific – There are many Cathay Pacific and Oneworld lounges to use in Hong Kong. I choose to visit The Wing, one of the Cathay Pacific lounges. The Wing is located in the main terminal, close to all of the shops and restaurants. The Wing is a luxurious lounge, boasting a coffee bar, noodle bar and cocktail bar. As well as some amazing cocktails, I also tried local dim sum and a bowl of wonton soup. The Wing also offers a large shower complex where you can freshen up before your flight. I took the opportunity to have a shower and freshen up before my onward flight to Adelaide. British Airways – Boarding at Terminal 5 was very efficient. The flight departed from Satellite C, and we stayed in the lounge in the B Satellite until 30 minutes before departure. When we arrived at the gate we joined the fast track queue and boarded almost instantly. Cathay Pacific – Again, I waited in the lounge until after boarding began, when I arrived at the gate general boarding was taking place. However, I used the business lane and boarded straight away on a separate air bridge directly to the forward cabin of the aircraft. British Airways – The seat was one of the latest generation flatbed Club World seats. I did not pre-book a seat, so unfortunately all the window seats had been taken. I did manage to get a seat next to my travel companion in the centre section of the aircraft, located on the upper deck of their new A380 aircraft. I choose the seat facing backwards as the upper deck is narrower than the lower, so the middle seat is completely enclosed on its own. This offered excellent privacy so I could catch up on lots of sleep. I could of course speak to my companion by lowering the divider between the seats. Cathay Pacific – The seats are in a herringbone configuration, so they are all slightly at an angle facing towards the window, or slightly towards your companion if seated in the centre section. This gives every seat direct aisle access. I was able to book seats on this flight for free in advance, so I booked two window seats, one in front of the other. British Airways – A very comprehensive drinks selection was available. A range of teas and coffees, all premium spirits, including Tanqueray – so I was very happy, three different champagnes including Tattinger and a vintage 2004 Castelnau. They also boasted a great selection of fine wines. I enjoyed a couple of glasses of the Bordeaux with my meal. Cathay Pacific – A very large selection of drinks available, with local wines from the destination such as a 2013 Dandelion Vineyard Shiraz. An equally good selection premium spirits, tea and coffee, and many soft drink options. To get myself in the Aussie mood I enjoyed the Barossa Shiraz followed by a glass of the tawny port. British Airways – I was given the choice to pre-book my meal up to 30 days prior to departure. I chose the duck roasted in Chinese spices, served with rice and steamed Pak Choi. You were not able to pre-select your starter, which I did find a bit odd if you could select a main. However, I did get my first choice of starter as well as my cheese and biscuits for dessert. Cathay Pacific – There was no option of pre-booking meals on this flight, however the food was second to none. Absolutely stunning. To start I had sesame smoked salmon and marinated prawns, a seafood curry for main and then a cheese platter to finish. All of which was perfectly executed and was in my opinion of à la carte restaurant standard. British Airways – Despite the Club World cabin being full, I had a complete overhead bin to myself, which I used for my carry on case, laptop bag and bedding when not in use. There was also a personal storage drawer in my seat area where I stored my phone, iPad and other small items that I would need during the flight. Cathay Pacific – Again, despite the cabin being full, I had a full overhead bin to myself. I had more personal storage in my seat area than on British Airways flight, but I only utilised the storage for my shoes. Everything else was placed in the overhead bin as I intended on getting a decent amount of sleep on this flight to reduce my jet-lag upon arrival. British Airways – A large range of films, TV shows and music to listen too, including many new release titles. I don’t tend to use the on board entertainment too much, as I prefer to either get on with some work, or get some sleep. However, I did watch a film at the beginning of my flight. One thing I do like is to have the moving map on my screen so I can track the flight. British Airways’ moving map was very interactive with lots of options. Cathay Pacific – The on board entertainment was as good as the offering on board British Airways, however due to being quite tired I went straight to sleep as soon as dinner was finished and didn’t awake until breakfast was being served. I did have the moving map on for the duration of the flight. British Airways – A small amenity bag with essential items was handed out just after boarding. The bag itself was just a basic drawstring type bag, however it was full of Elemis products. Cathay Pacific – The contents were similar to those found in the British Airways amenity bag, although the Cathay bag was much nicer in presentation. It was the sort of bag that could be re-used on a future trip. 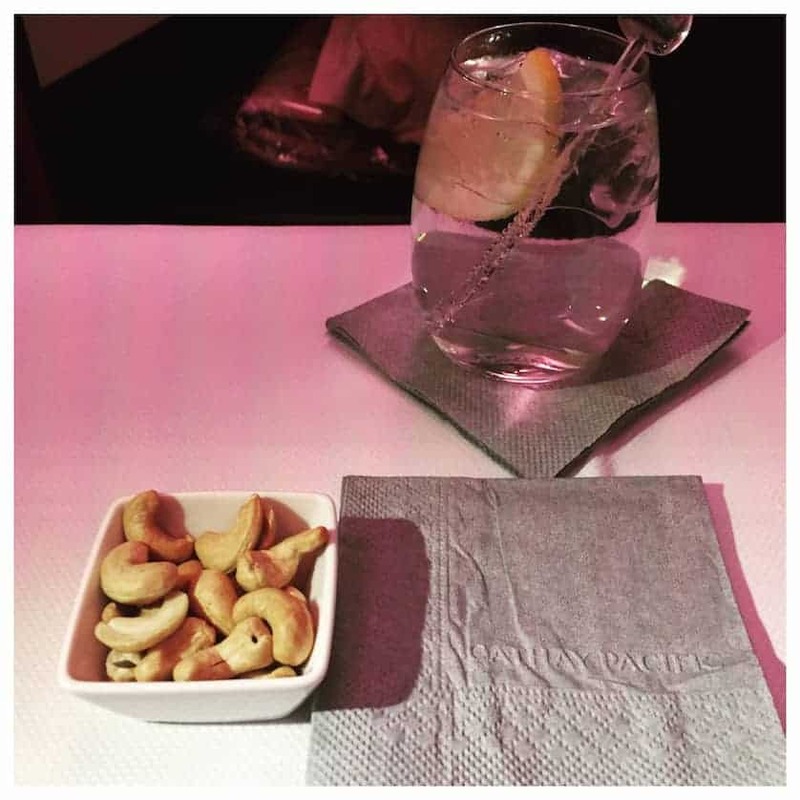 British Airways – You had the use of the Club Kitchen, where you can help yourself to drinks and snacks during the flight. I didn’t use this as I actually slept for 7 hours straight after my dinner and woke up as breakfast was being served. I just opted for a light fruit platter as I was not overly hungry and I had another ten hour flight a few hours after landing. The British Airways A380 upper deck had large toilet facilities, they are in fact in the same space that Emirates use for their onboard shower rooms. Cathay Pacific – There were no onboard extras such as the club kitchen, or large toilets. However, the crew was extremely attentive and nothing was too much for them at any point throughout the flight. British Airways – I was lucky enough to be on the first row from the door so I was one of the first off the plane. Very quick. 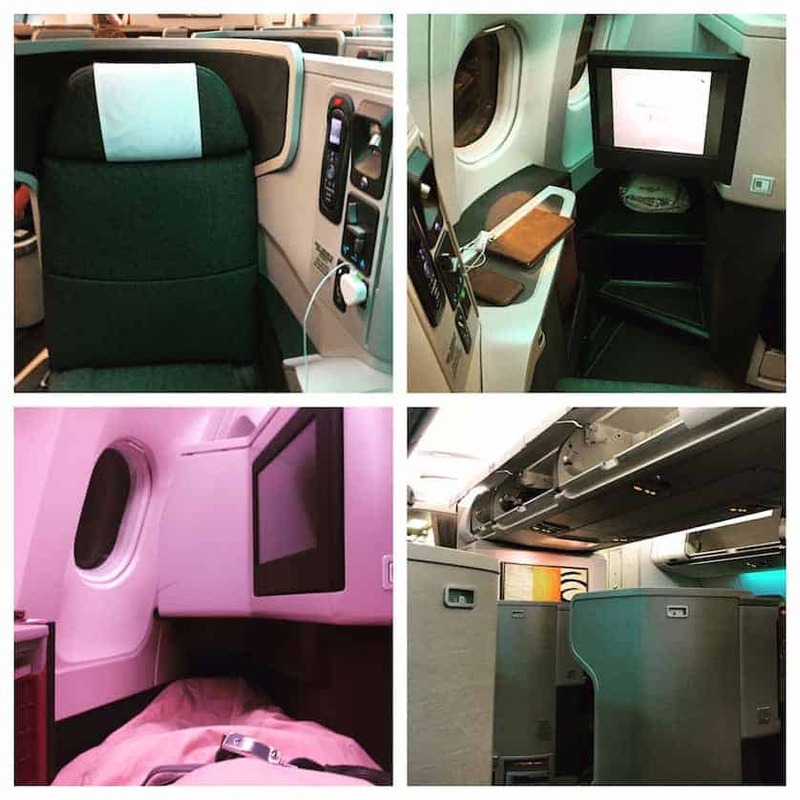 Cathay Pacific – My seat was three rows from the front, however the seating plan on Cathay Pacific was less dense than on British Airways, so I was still off the aircraft extremely quickly. British Airways – As this was a connecting flight I did not need to collect my luggage, just visit the transfer desk to make sure it was transferred onto my connecting flight. Cathay Pacific – I had priority labels on my luggage throughout the flights, so my luggage was one of the first to appear at luggage reclaim. Both airlines offer excellent service, delicious food and drink choices and an ample amount of personal space. I have travelled on both airlines before and wouldn’t hesitate to travel with either of them again. The only plus side to the Cathay Pacific flight was the seating layout, but this seating layout has yet to be rolled out across their entire fleet, so that in itself wouldn’t be a deciding point for me. The images in this review are my own, apart from a few select images from British Airways media office, used with their permission. Miami Beach, the Ultimate City Break!